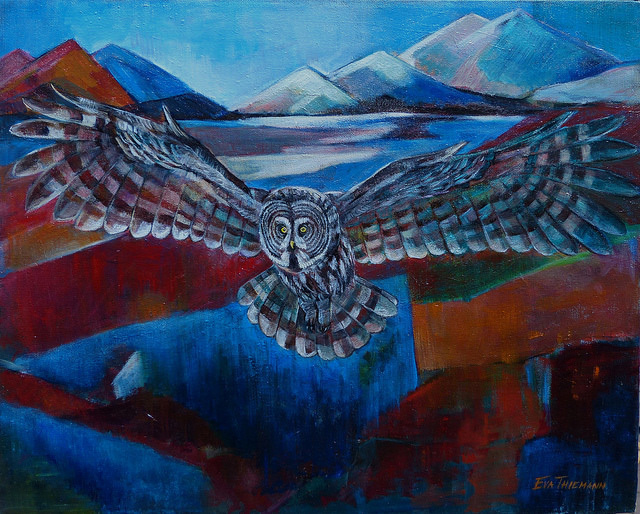 Eva is a local artist who paints in oils and is best known for her artwork featuring the bears of Alaska’s Denali and Katmai National Parks. 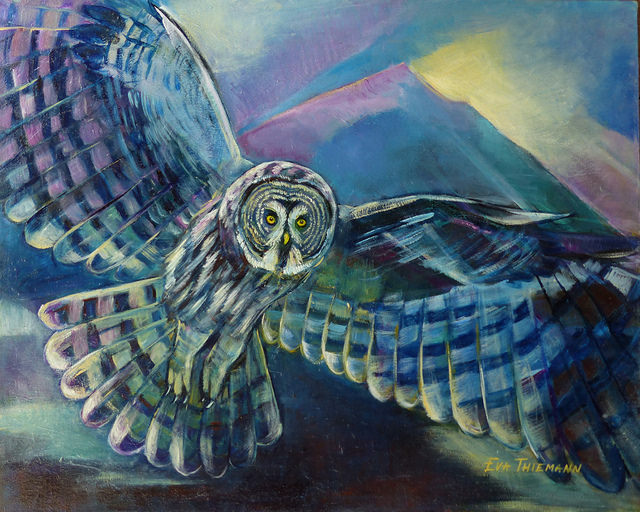 Additionally, Eva has produced a number of paintings featuring various species of owls and wolves. Educated in Riga, Latvia with degrees in both Biology and Art, Eva enjoys traveling throughout the Pacific Northwest, Alaska and the Rockies, submerging herself in the flora and fauna these beautiful regions have to offer. An avid birder and hiker, she discovered a passion for Oregon birds including Great Grey Owls, Northern Spotted Owls, Barred Owls, Barn Owls, Burrowing Owls and Great Horned Owls. Over many nesting seasons, Eva had numerous Great Grey Owl sightings, allowing her to observe this elusive owl. She studied young fledglings and adults in all seasons, perched secretly in trees at the edge of meadows. With her passion for nature, Eva has captured the realistic beauty of her subjects while opting for surrealistic, dreamy backgrounds. 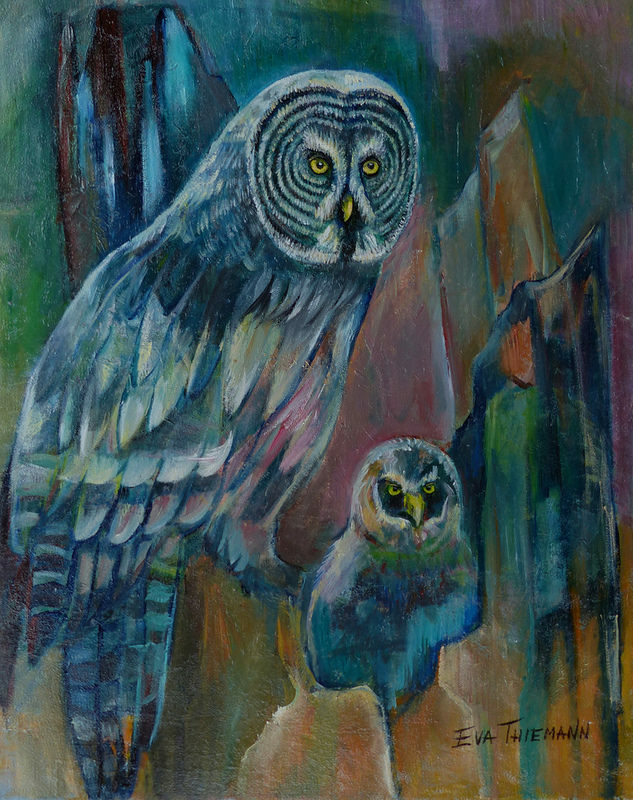 One not only sees the majesty of these animals on canvas but is also invited, by the artist, to “feel” the experience amidst soaring mountains, deep wooded forests and nighttime skies. Eva’s artwork has been featured in a number of venues. Her paintings have been displayed in galleries and wineries across Southwestern Oregon. Her bronze sculptures have been exhibited in Europe as well as local Medford galleries. Some of her video footage of Alaska Peninsula brown bears was included in the National Geographic shows: King Bear, Plane Carnivore, Animal Fight Night, and Urban Jungle.